German-American painter Albert Bierstadt was born in Solingen, Germany on January 7, 1830 but his family moved to New Bedford, Massachusetts when he was one year old. He showed a liking for art at a young age, using crayons to make sketches. He studied painting in Düsseldorf for several years before returning to the United States. He started doing oil paintings when he was 20. Bierstadt became famous for his large size landscapes, most of them depicting Western American wilderness scenes and animals. Albert Bierstadt, together with Frederic Edwin Church, was a famous member of the Hudson River School of Romantic landscape artists during the 19th century and was an important member of Luminism, together with George Caleb Bingham. He was also a Rocky Mountain School of painting member. 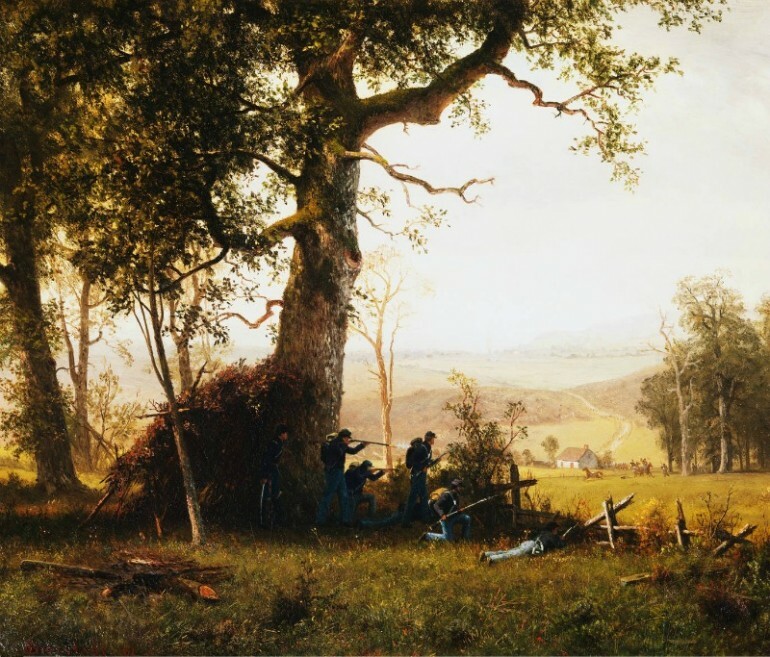 Their specialty was to paint large canvases of mountain scenery, which showed subjects in great detail and lit by the characteristic glowing light of luminism. Two of his most famous paintings include the “Domes of Yosemite” and “The Rocky Mountains.” The latter is found at the Metropolitan Museum of Art in New York. Members of the informal school of landscape artists strongly advocated plein air painting and using subdued colors. Albert Bierstadt stayed in Europe for four years, honing his craft with travels to various countries including France and Italy to study the works of the Old Masters. In 1857 he went back to the United States and taught painting and drawing for a while before concentrating on his art. His earlier paintings during this period were based on the European scenes that he saw during his travels. 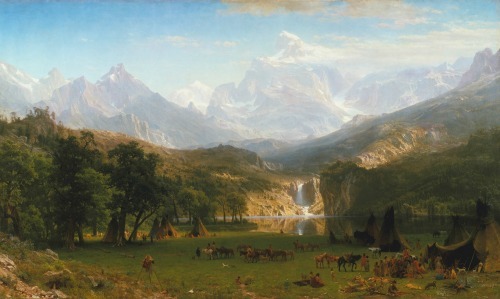 His fame and earnings increased when “The Rocky Mountains” was exhibited together with the work of Frederic Edwin Church, who, at that time was a highly successful and respected landscape artist. In 1864, President Abraham Lincoln ceded the Yosemite Valley to the State of California. New York City financier and businessman commissioned Albert Bierstadt to paint the Yosemite Valley for the sum of $25,000, which was a huge amount at that time. The painting, the “Domes of Yosemite” was created at the time when people in the United States were starting to discover the beauty of their own land. Bierstadt created a dramatic image. He narrowed the valley and accentuated the height of the mountains that could be likened to the soaring characteristic of gothic architecture. His reputation and his effort to reach new markets in Europe earned him several accolades, including medals from Germany, Belgium, Bavaria and Austria. He exhibited two paintings during a private reception with Queen Victoria in 1867. He also created many paintings of the Yellowstone region from 1871, which greatly helped in the passing of the Yellowstone Park Bill in 1872. Thus, Yellowstone became the world’s first national park. The U.S. Congress later bought a large painting from him. Likewise, most explorers heading towards the western part of the United States requested his presence. Bierstadt, who continued to visit the American West throughout his career, created about 500 large paintings. Most of them could be found in various museums across the United States.